I was hoping to take it easy today and prepare for Hurricane Irene as it makes its way toward the East Coast, but Alan Reynolds, a very good economist (UCLA undergrad) whom I have known and liked for a long time, got in the way. Alan somehow has gotten the idea that monetary policy cannot stimulate a recovery, thus adopting the doctrine that kept the US from recovering from the Great Depression for over three years until FDR courageously devalued the dollar and took US off the gold standard. I thought that Alan understood this, especially because he read the manuscript of my book Free Banking and Monetary Reform as I was writing it, and seemed to have understood and accepted the argument I made about the monetary (i.e., the gold standard) cause and the monetary cure of the Great Depression. Alas, either I did not succeed as well in enlightening him as I had thought, or he subsequently reverted to some old mistakes, our interactions having become increasingly less frequent. So I take no pleasure in criticizing Alan, but, hey, a blogger’s gotta do what a blogger’s gotta do. Alan, the creme de la creme of contributors to The Wall Street Journal editorial page, wrote an op-ed today accusing the Fed of having slowed down the recovery by adopting its program of monetary easing (QE2) last fall. This is a remarkable and, on its face, counter-intuitive claim. Nor does Alan provide much in the way of a theoretical explanation for why monetary expansion would would have slowed this recovery down, in contrast to other recoveries in which it hastened recovery, he suggests that by causing the dollar to depreciate, monetary expansion fueled a commodity price boom, thereby driving up costs and reducing the profitability of US businesses. I don’t think that is a very plausible theoretical argument about how QE2 affected the economy. On the other hand, even Ben Bernanke has been unable to give a proper explanation for how monetary expansion would cause an economic recovery. Bernanke argues that monetary expansion reduces interest rates, already close to zero at the short end of the yield curve, at the long end of the yield curve. But Reynolds has no problem showing that long-term interest rates rose almost from the get go. To Alan this suggests that there was no stimulus, but on the contrary what the rise in long-term interest rates shows is how effective the stimulus was in improving expectations of future cash flows. The improving expectations of future cash flows fueled the rise in stock-market values starting in September (after a miserable August 2010 in which stocks fell by about 8 to 10%). (The S&P 500 rose from 1047.22 on August 26, 2010 to 1343.01 on February 18, 2011.) In my paper, “The Fisher Effect under Deflationary Expectations,” I provided evidence that the stock market, in contrast to what one would expect under normal conditions, has since 2008 gone up and down in close correlation with changes in inflation expectations. I discussed this phenomenon in a previous post. Alan thinks that because the dollar fell against the euro from $1.27/euro to over $1.40/euro, and because commodity prices rose fairly sharply (perhaps by 25% in the six months after QE2 was announced) that there was no benefit from monetary expansion. Again, Alan has a bit of an excuse for his misunderstanding because those explaining the program, e.g., Christina Romer, Obama’s chief economist at the time (and a good one at that who should have known better), explained that a declining dollar would make US exports more competitive in world markets, failing to point out that there is a countervailing tendency. Alan correctly points out that a weaker dollar also makes imported products more expensive, so that the dollar cost of imported raw materials and capital equipment rises, diminishing the gain from a cheaper dollar to US exporters. However, US wages don’t rise (at least not without a very long lag) as a result of a falling dollar. And since, for most businesses, wages are the largest cost item, the falling dollar did in fact help to increase the profitability of US exporters, something Alan himself confirms when, in a different context, he reports that the operating earnings per share of S&P 500 companies were $24.86 on June 30, 2011 compared to just $20.40 a year earlier. It is the increased profitability associated with increasing the prices of output faster than cost that is the primary (but not the only) explanation of how QE2 was supposed to stimulate a recovery. It was partially successful, as attested to by the increase in stock prices from September 2010 to February 2011. However, the recovery was stalled by a string of one-off events that disrupted and partially reversed the increase in production that was getting under way: a severe winter, a big runup in oil prices in February as a result of the shutdown of Libyan oil production, and the earthquake and Tsunami in Japan in March [update August 28, I failed to mention the effect of the European debt crisis which also began to worsen again at about that time]. I am sorry to say that Alan fudges a bit in discussing the increase in commodity prices in general and oil prices in particular. He attributes the entire increase in oil prices to quantitative easing. In fact between September and February oil prices rose about 20-25%, reflecting the increasing optimism of traders that a recovery was gaining traction. 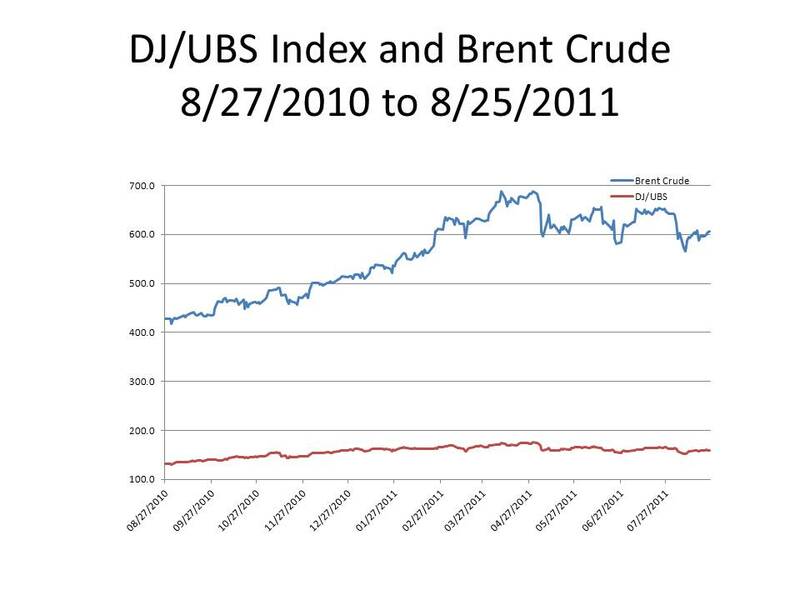 That increase in oil prices was in line with the increase in other commodities. 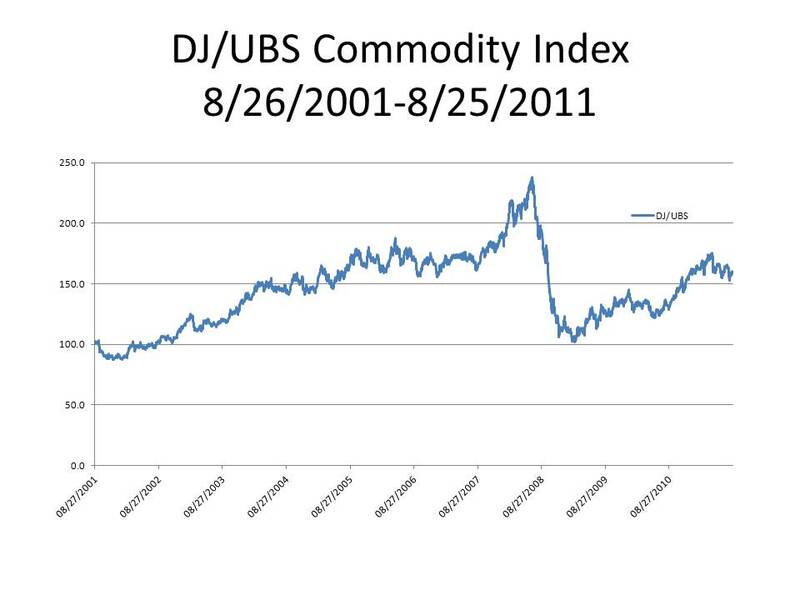 The Dow Jones/UBS commodity price index increased about 30% between September 2010 and February 2011. Since commodity prices, including oil, had dropped sharply after the 2008 crisis, it is not surprising that an anticipated recovery would have caused a significant rebound in the prices of commodities in general, and especially oil demand for which is highly sensitive to overall economic activity. However, from February to April, crude oil prices increased another 20%, coinciding in the US with the spring changeover to higher ethanol requirements, driving gasoline prices to all-time records, thus dealing a blow to consumer confidence. In short, my old friend Alan Reynolds blames everything bad that has happened over the last year on monetary causes, but can’t provide a coherent explanation for why monetary expansion would not stimulate the economy, something even Robert Barro was willing to concede as recently as January 22, 2009 in the Wall Street Journal editorial page. David When I read Alan Reynolds piece late last night I made a bet with myself that you would pick it up (given that you said the Journal is an unending source of inspiration)! So I did something else. I find this type of discussion about commodity prices curious. Theory would predict that Fed easing might lead to inflation through commodity and import price pass-through. We saw exactly this pass-through; and yet QE-proponents seem to go to great lengths to deny the Fed had anything to do with it. Then, they just as strenuously claim that the QE can influence the price level. So which is it? Did QE cause the price level to rise? If so, commodity prices must have been a link in the chain of causation. If not, then by implication QE failed to achieve its intended goal. Maybe this post will convince you that the US MP & Commodity price nexus is not so clearcut. And no one said that QE´s objective was to influence the price level. More likely influence spending and economic activity. FDR stated an explicit PLT. Crickey-Almight, where to start with your friend Alan Reynolds. I will just hack off one piece. Labor. Unit labor costs have been falling. Unit labor costs were at 108.5 in 1Q 2009, then fell to 105.0 in 4Q 2010. They have started edging up again, but are still below 2009 levels. I don’t think falling unit labor costs are consistent with the inflation that Chicken Inflation Littles are hysterical about. Indeed, since most commercial rents are also falling, we get roughly 60-70 percent of business costs going down, not up. I realize in the USA we think the world revolves around us. But commodities are global markets. You have two huge economies growing pretty well–India and China, with about 3 billion people. Reynolds must be drinking the kool-aid at the WSJ. I expect if we get a GOP president in 2012, Reynolds will change his tune, and become open to an expansionary monetary policy, perhaps citing a reduction in structural impediments. I find your data compelling: China contributed to the rise in commodity prices since 2000. By how much did Fed easing (and negative real rates) amplify that increase? This is virtually unknowable. It is also irrelevant to the dilemma I posed above: either QE caused inflation via commodity and import price pass-through; or QE failed to raise the price level. Take your pick. Which one was it? Small question, David feel free to answer, you won’t be afraid of it. Nothing that puts you personally under a microscope. When the US started QE2, did that change China’s preferred method of investment? Did they come off Dollars and start buying copper, gold, etc? Pearson, until now I understood that the monetary expansion determine the internal wages and prices, not the world prices. If not, you are proposing that no country has the sufficient monetary authonomy to decide its own monetary policy. Wages and internal prices (deflactor) are the guide to monetary policy. are not you doing the similar mistake than others with the gold prices, who atributed its high level to QE2? I think that there is a fault line in the exchange rate policy of many countries, pegged with the dollar, as the main reason of the global demand rise. After reading Reynolds, I have seen the light. The dollar will rise in value, and commodity prices will fall. This will reduce costs for U.S. business, and the U.S. economy will boom! Better yet, drop the quantity of money to zero! Then, the dollar will have an infinite exchange rate. And it will be like manna from heaven! Realistically, Reynolds seems to be advocated fixed exchange rates. Reynolds is confusing supply shocks with demand shocks. If an expansionary monetary policy succeeds in boosting demand and commodities rise in that context, NGDP, RGDP and commodity prices all move together. Conversely, a negative supply shock will boost commodity prices, lower RGDP and leave NGDP relatively unchanged (assuming the CB doesn’t tighten). That RGDP weakened in 1H11 but NGDP continued to post modest gains suggests a good portion of those booming commodity prices (at least for oil) were due to a series of negative supply shocks. And, yes, Reynolds was indeed one of the supply-siders who argued the Fed was too tight in 1984-1985 when most inflation metrics were much higher than they are today. He also focused on the low levels of non-energy inflation in the 2000s and dismissed the 30% per annum oil and industrial commodity price gains as having anything to do with Fed policy. Hmmmm. yes, It is a problem. It is a good part of the Crisis; not only to US. But you can´t renounce to monetary freedom, I suppose. Bill, Mundell who is the only living economic genius advocates a fixed exchange rate. His argument is simple: when you have a free trade agreement, you are tacitly agreeing to a fixed exchange rate, otherwise you aren’t really agreeing to free trade. These snake oil pieces are a dime a dozen in the WSJ. I love how they conflate correlation with causation if it makes for good rhetoric. Industrial commodity prices have a very high correlation to industrial production, but also a high correlation to QE. Perhaps QE causes both? As for oil, how can you ignore the effect on oil prices of the disruption of 1.8 million barrels per day of Libyan oil and still claim to have any integrity as an economist? QE would raise the average price level through higher incomes in the non-tradable sector. 1/ What I think Reynolds appears to be suggesting is that QE would depreciate the USD real exchange rate for tradable goods. The RER is pegged by the law of one price so that tradable goods follow purchasing power parity. However, commodities which are also tradable and priced in USD would obviously rise inverse to USD depreciation. Since trade is a relative small part of the US economy the gains for the tradable sector are more than offset by the loss in the non-tradable sector. 2/ QE depreciating the USD RER reduced US non-tradable sector productivity and profitability. A reverse effect of Macdonald & Ricci IMF paper. “an increase in the productivity and competitiveness of the distribution sector with respect to foreign countries leads to an appreciation of the real exchange rate, similarly to what a relative increase in the domestic productivity of tradables does”. 3/ If QE reduced capital inflows to the US, money price productivity in non-traded goods would have been exogenously lowered through currency depreciation. Therefore, the RER/Income correlation would be negative. This recession was the first in which the non-tradable sector accounted for the vast majority of job losses. One of my biggest issues with the 1933 comparison is that the economy back then was dominated by the traded sector. Its response to monetary stimulus and devaluation was quite different than today’s for the reasons you cite. This wouldn’t be much of a problem if the service sector were enjoying secular growth, as it did arguably up to the late nineties. Back then, the sector had very little cyclicality in employment. This recession indicates that the period of secular growth is over. I don’t hear the implications of this important structural shift discussed much. sbanicki, I am sorry, but I don’t see how quoting the preamble to the Constitution (which I do not in any way mean to denigrate) tells us anything about whether the Fed is pursuing an appropriate monetary policy. I agree with you that a number o the public works measures that you mentioned probably did a lot of good and contributed to the economic and social development of the United States, but I will also take the unexpected opportunity that you provide me to voice my opinion that the construction of the interstate highway system is one of the worst things that ever happened to this country, literally destroying diverse thriving nurturing communities in both rural and urban areas throughout the US, destroying an immense stock of intangible social capital, leading to the displacement of countless families from their home and forcing them to find new places to live, work, and raise families at immense and completely unaccounted for social costs. Just thinking about it makes me want to weep. I think Eisenhower was an admirable human being and in many ways a good President, but his colossal mistake is an indelible blot on his presidency. What is totally amazing to me is that the interstate highway system is regarded as one of Eisenhower’s greatest achievements and one of the great historical achievements of the federal government even by those who, one would have expected, to have some regard for the human toll exacted by this blight on the American landscape. Whew! There I feel much better now. Marcus, You can read me like a book. I saw Kay’s article and then forgot about it until I saw your comment. It’s really good, so thanks. Did you see Stephen Williamson’s blog on Barro’s piece in the Journal? He also has a new followup. David, Did I deny that there was any effect on commodity prices? What I said was that the effect of rising commodity prices did not offset the effect of increased product prices, so that there was a net increase in the profitability of output. I admire what FDR did in 1933, and I wish we were trying to replicate that today. Marcus, I will have to look at your post more closely later, as I am rushing to catch up with comments. Clearly it was not the intention of the Fed to cause commodity prices to rise even though I am don’t find rising commodity prices that worrisome, and I also agree with you that there are plenty of non-US-monetary policy factors tending to raise commodity prices. Going back to David Peason, for just a second, part of what bothers me about anti-QE commentary is the axiomatic assumption that any and every increase in commodity prices can be attributed to Fed policy. Benjamin, You are correct to point out that declining unit labor costs and commercial rents are cushioning the effect of rising commodity prices on business profitability, so if output failed to increase as much as was expected after QE2, the reason was not rising commodity prices. David, Speaking for myself, I am perfectly happy to say that QE2 caused some increase in commodity prices which was not a bad thing. I criticized Reynolds for arguing that increased commodity prices explained by QE2 was a failure. That (WADR to Alan) is totally wrong. Morgan, I can’t really answer that. But it would not surprise me if they did begin to diversify their asset holdings somewhat. On the other hand, their holding of US treasuries are so great, that they cannot just dump them without risking a big capital loss. Bill, Well said. I think that you are right that Reynolds is inclined to support fixed exchange rates (and possibly even a gold standard, though I don’t think that he has ever committed himself to the idea of a gold standard). MTD, Thanks for providing that interesting background information. If you have references, I wonder if you could provide them. Morgan, Mundell has certainly done a lot of good work, but I don’t think that he can quite live up to your accolade. And I don’t find the free trade argument that compelling. Steve, Can’t argue with that. Richard and David, If one of the characteristics of the expansion preceding the crash was an overexpansion of the non-tradable sector relative to the tradable sector isn’t the adjustment you are referring to, shifting resources from the non-tradable to the tradable sector, an equilibrating adjustment? I agree that a larger tradables sector is a necessary structural adjustment. Structural adjustment is sometimes (most times?) detrimental to near-term growth. One guy moving mountains. How can you not be in awe? We could see that if certain commodities spiked more than others, right? 2. While the Asian (including Japan) economies transferred resources from the nontradable (“housing” sector) to the tradables sector, the US, as the only large growing economy at the time, transferred resources from the tradables to the nontradables (“Housing” sector). 3. Those moves were “equilibrium moves” “oriented” by changes in relative prices (“switching”). Asia also had to undertake “Expenditure Reducing” actions. They did (Many countries experienced drops of up to 8% in RGDP in 1998). 4. Do you think it´s a coincidence that exactly at thet moment, house prices began their long climb (that was also helped along by several other factors)? Now the world economy has to “move” in the other direction, with the US “switching” expenditures to the traded sector, which requires a dollar depreciation. The expenditure reducing part of the adjustment has (probably) gone far enough already! Great observation. China could adopt the role that we had previously (consumption-led growth). The problem is China refuses to have a maxi-reval. If they did, though, our import price and tradables inflation would really take off. David, please explain why Mundell’s point that Free trade and pegged currency is part of the same package. You can’t really have free trade without keeping your currencies aligned. David, In the present episode the appropriate countercyclical policy promotes the necessary structural adjustment. Your thought-experiment is a good one. Unfortunately, he instituted interest on reserves and he did not specify a price level target. David, All the Chinese need to do is to stop sterilizing the domestic inflow of dollars at the current exchange rate. If they did the rate of domestic inflation would rise and then they would have to choose between controlling their inflation rate and maintaining the peg. Either way, they would start importing more and exporting less. Morgan, I’ve seen Mundell up close and was not impressed. About free trade and fixed exchange rates, I can’t explain a point that I haven’t seen. But perhaps it might go something like this. If you imagine a world with only a single currency then all prices in all countries would be expressed in a single unit. In that world, there would be no exchange rate issues to interfere with the free flow of goods between different regions and the direction of trade would be that predicted by the underlying theory of comparative advantage. With fixed exchange rates you approximate the world of a single currency because the different currency denominations can be translated into a common unit by applying the fixed exchange rates and different currencies became simply different denominations of the a single unified world currency. The problem with that is that national currencies issued by different national central banks do not necessarily result in prices that would correspond to the prices of a single unified international currency. If a central bank wishes to do so it can sterilize inflows and cause its domestic currency to become undervalued as a kind of protectionist strategy as China seems to have done. So fixed exchange rates don’t necessarily eliminate the opportunity to practice protectionism by exchange rate manipulation. Flexible exchange rates can lead to departures from purchasing power parity (PPP) that would be impossible under a single world currency, and perhaps even more severe than would be possible under multiple currencies tied together by fixed exchange rates. But in a world of multiple currencies, there are a lot of factors to consider besides the theoretical ideal of a single unified currency, and whether fixed or flexible exchange rates are preferable depends on a lot of issues, not just the single criterion that Mundell identified. Hope that helps. rofl. you do not judge, you are judged for your opinion. my god man, this world is what we want!!! this is when there is no more macro-economics. INFACT, when you agree to a Free Trade Agreement, that’s exactly what you are morally doing. Dude, that’s the KEY BENEFIT, under a single currency THERE IS ONLY ONE CENTRAL BANK and it has no allegiance to any nation – it’s focus is maintaining the legitimacy of the currency. You get the same thing under competitive private currencies. Which ever private currency never inflates, becomes the storehouse of value, the clear choice from those that have savings. The WHOLE point is a conscience choice that it is better to people world wide to share money and trade, and then to put power in their own national government or its leaders. You seem to skip over the basic thought – one currency is good precisely because it weakens governments. If you aren’t impressed with that goal it is very hard to take you seriously. Morgan, I don’t know what was funny about that, but it was not something that I should have written for public view. You don’t think that there can be macroeconomics for a closed economy? That’s the model of the General Theory. I don’t understand your comment about Free Trade Agreements. One central bank with no allegiance to any nation? Do you think the tea party will be OK with that one? So you are into competitive private currencies? You need to read my book. It look like our buddy Ben Cole just bought a copy and wrote a review for Amazon. Check it out. I am impressed with the goal of weakening governments to arbitrarily violate and abridge the rights of their citizens. But there are many ways that governments can do that and if you stop a government from doing it one way, it can usually find other ways, possibly more destructive of liberty, to achieve their goals. So it’s all very complicated. Morgan, if you can’t take me seriously, I will understand. Really I will. But I know that you will give it your best shot. Free trade means no effort to control the flow of goods or capital regardless of advantage without protection for labor and any other such nonsense. It means real unadulterated competition. It’s the kind where Ricardo kinda laments that capital will go find returns, and hopes that people with capital will want to invest in their homeland, but even if they don’t – free trade is still best. So yes of course, one central bank without allegiance to any nation. Why do you presume the Tea Party won’t be the backbone and basis of said bank? The guys with cash/capital/talent/hard assets/property, want their money to never be inflated, they want it infinitely divisible, with the government in a beta role, flat consumption taxes, and government power in decline. What do you think they are buying gold for? They HATE Central banks printing money. Look, Mundell has forced Greece to dance to Germany’s tune! Everyday they have to become more conservative. Southern Italy is on a leash to Northern Italy. Governments are HATED for their actions by the lazy and loafish, they are rioting, all the while, the countries move towards a GLORIOUS change: monetary union without fiscal union. This is what a good economist does. He makes people behave conservatively (with a small c). That is the progress of history. You need to get over the idea of governments that “arbitrarily violate and abridge the rights of their citizens,” what matters is what we in the US do, and here the Tea Party is about ending that. Taxes (and guns) are after all the Prime Method of strong government. Look think of it this way: a whole bunch of private currencies ends up int he same place a single global currency with a central bank not aligned to a country. It doesn’t go anywhere else. Do a google search on “international bankers” and then you’ll know. Oh yes, I forgot how really, really well that’s working out. Morgan, I guess the world just seems a lot more complicated and harder to figure out to me than it does to you. 1. Obama makes Bush tax cuts permanent. Basically Obama apologizes, says he was wrong. 1. Cut pensions in Southern states. Now look, this is the guy who set all this in motion. It is all VERY REASONABLE. It was EXPECTED. Basically, everybody becomes more capitalistic, and more people get out of the wagon… or DOOM. The die has been cast, we started down this path long ago. He’s just point out we had better finish the journey. Now this is a world class economist, he does not write a blog called the “Conscience” of anything, he delivered Reaganomics, the Euro, and now does advises China’s policy. He says the big swings in exchange rates have been responsible for lot sand lots of our economic crisis. Look, his basic theory says you get 2 of 3 things, and the one we’ve chosen to give up, is the one you should be happy we threw out. We’re going to keep free flows of currency. We’re going keep stable prices. It is going to cause some anger. But you have to ADMIT it is indeed the once that weakens governments. Actually, Morgan, my point was not to say that I am opposed to an international central bank, but that the tea party would have lots of problems with the idea. The gold standard was an international institution dependent on in a number of ways on international cooperation, that’s why I don’t think that the tea party will actually go along with the creation of the international mechanisms required to revive an international gold standard or some other more Mundellian creation. Despite my earlier put down of Mundell, which I regret, he has done a lot of excellent work. But however much you may appreciate him, I don’t think that the tea party will share your very charming enthusiasm for his achievements, especially as regards international money. But I am just guessing. David, you aren’t selling it right. It is going to be a single currency RUN BY THE TEA PARTY. See how quickly, it becomes politically viable? Morgan, Who is going to be the head of the central bank, you or Mundell? I often defended Ben in print right until QE2 when I wrote (WSJ Nov 2010) that flattening the yield curve was an odd way to encourage bank lending, and that the market (TBT) was rightly betting long-term yields would rise rather than fall, as promised. I never said the Fed was wrong to accomodate the rising demand for monetary base in 2008-2010. But QE2 (and now the “twist”) attempted to do much more than that. There is certainly nothing unusual about my suggestion that QE2 was designed to push the dollar down, that a falling dollar leads to rising prices of commodities, that the U.S. is a net importer of many critical energy goods, metals and nonfood agricutural goods, or that harming the terms of trade is not a stimulus. If anyone disagrees with any of that, explain why. Many efforts to debase the dollar have ended with a spike in oil prices which always ends in recession. That is, QE2 was flirting with recession. If I agreed that the economy was suffering from a monetary squeeze in August of 2010, I would have proposed suspending interest payments on reserves (which, with regulations, have helped make Treasury bills a rising share of bank credit). Reducing the liquidity and safety of the Fed’s portfolio is no way to secure the future value of Federal Reserve notes. Alan, Thanks for taking to respond on my blog. I remember the November 2010 piece that you wrote in the Journal. I didn’t like it, for just the reasons that I mentioned in my post, namely that you were judging it on the obviously incorrect justification (QE2 would reduce long term rates) offered by Bernanke rather than the obviously correct justification that they would increase nominal and real GDP, raising interest rates across the board. All your assertions about what QE2 was designed to do could be correct, but would still not imply that QE2 was not a stimulus, simply because output prices would still rise faster than costs and because increased inflation expectations would induce increased spending by both business and households on investment and consumer durables. I wish that you would propose ending interest payments on reserves. I think ending interest payments on reserves might well have done more to stimulate recovery than QE2, but would do so by a mechanism similar to that triggered by QE2. If you ever do, I will sing your praises across the land.